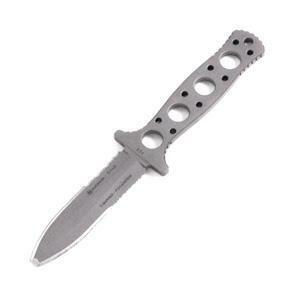 Titanium knives first appeared as alternative material for diving knives. Titanium corrosion resistance to saltwater was especially attractive for the field manufacturers that discovered a previous unknown and potentially invaluable possibility to fulfill divers’ increased demands for reliable tools. Titanium toughness made also a perfect fit for the particular jobs that were taken underwater – cutting strong lines, breaking wood elements hardened by the prolonged saltwater exposure, going through coral pieces or sea-life shells. Among the largest first consumers were the Navy Seals. Besides the advantages that were appealing to all the scuba-divers hearts, military personnel also needed the non-magnetic properties of titanium that helped them a lot when dealing with the sea-mines they encountered. Titanium was also a well-known material for the military industry which definitely made things a lot easier with the purchasing department of the department of defense. 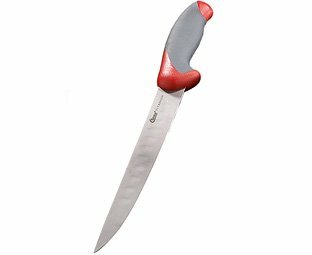 Titanium knives used for diving are amongst the few consumer products that are made entirely out of titanium or titanium alloys. Beta alloys are preferred due to the superior toughness they posses, compared to the other titanium alloys. It is not uncommon for the manufacturers to use special treatments in order to enhance titanium “natural” properties. There really isn’t much room for anything else because of the unforgiving environment where they are primarily used. Any compromise made is likely to manifest itself rather sooner than later. Titanium knives blades extend well beyond the visible part, inside the handle. The handle, if not made entirely out of titanium itself, is carved out of composite materials strong and corrosion resistant enough to withstand the ocean’s power, supported by titanium bolts and fasteners. Due to the initial and lasting market success of diving titanium knives, other type of knives were produced and marketed, but usually is just a common situation were titanium is used mostly for its PR value, rather than its intrinsic qualities. There are certain advantages for a titanium knife used mostly for cooking, such as longer lifetime of the cutting edge and the practical lack for maintenance that other materials require to preserve their initial state for a long time. However, generally these don’t justify the higher price tag that is attached to all of the titanium products. Titanium knives may still provide a good solution for those situations where its advantages are put to good use. We’re talking about the instances when knives are not going to get proper care and cleaning - camping, hunting, and fishing. Contrary to what many people think, even high quality high-carbon, stainless steel is susceptible to rust if it’s not properly and regularly cleaned. Titanium blade, even if you just wipe it off on your fishing vest or just swish it in a stream and toss it into your pack, will never rust and always be pristinely clean. An accidental drop on a hard, ceramic floor guarantees a good chance for a blade of snapping in half or having the cutting edge shatter. These will never happen to a titanium blade. A more economical solution is to use titanium coating on a cheaper knife core that offers all the benefits of titanium, but dramatically lowers the price, down to tens of dollars instead of hundreds.